inflation remains subdued and economic growth slows. 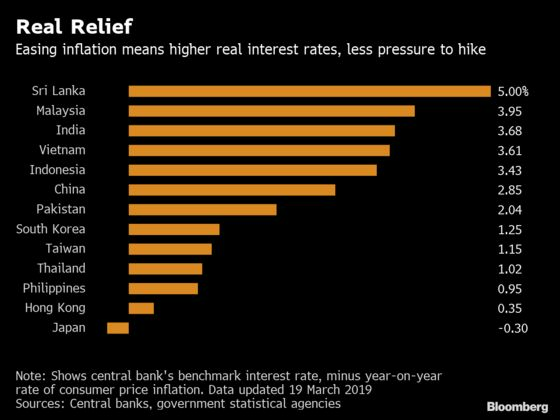 (Bloomberg) -- The Federal Reserve’s abrupt policy shift has opened the door for interest rate cuts across Asia as inflation remains subdued and economic growth slows. Taiwan’s central bank followed peers in Southeast Asia by keeping its benchmark rate at 1.375 percent, citing mild economic growth and a stable inflation outlook. The Fed’s decision is also playing out in developed economies. The Swiss National Bank held its key rate on Thursday, while rising oil prices led Norway to hike, as expected. The Bank of England is forecast to remain on hold.